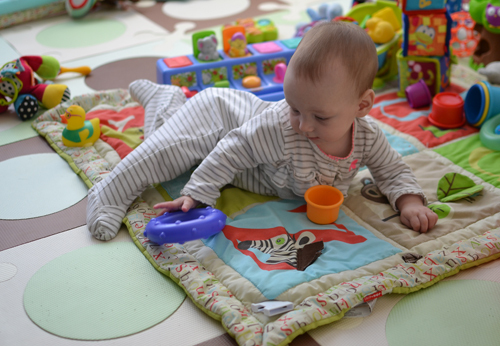 Before having my baby, it was hard for me to imagine just how much stuff a tiny human being needs. Before I knew it, our living room was overtaken with toys, chairs, books and stuffed animals. As you may know, we recently moved into a new place. Like so many people in LA, we live in a condo so our space is rather limited. Since I love being organized and can't stand clutter, I decided to designate a space in a corner of our condo for Eliana's play area. 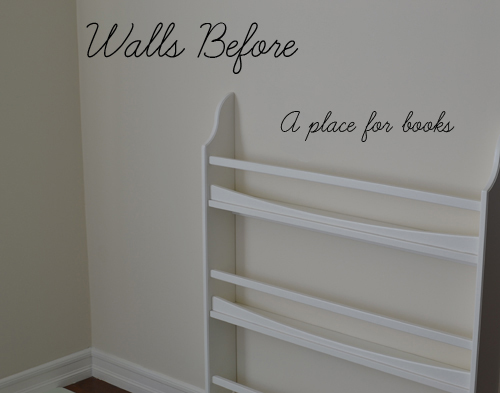 When it came to filling the empty space on the walls, I immediately turned to Avalisa. 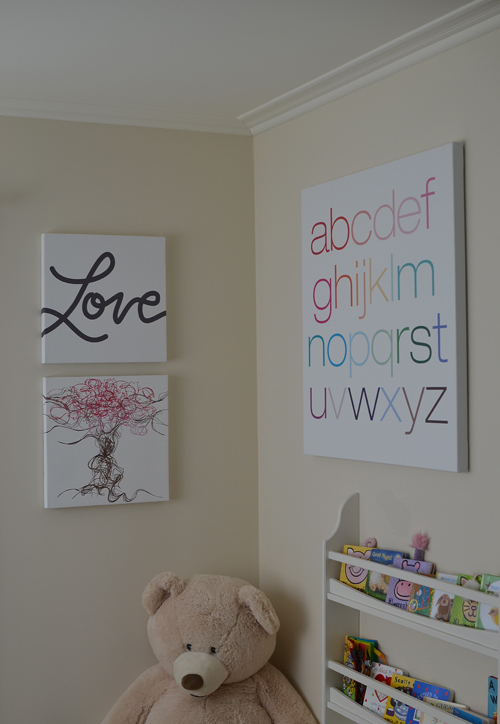 Their prints are modern, cheerful and simple in design, which is exactly the look I was going for. I've been a fan of Avalisa prints for a long time, which you may remember from this post a while back. Now one of these chic prints can be yours! 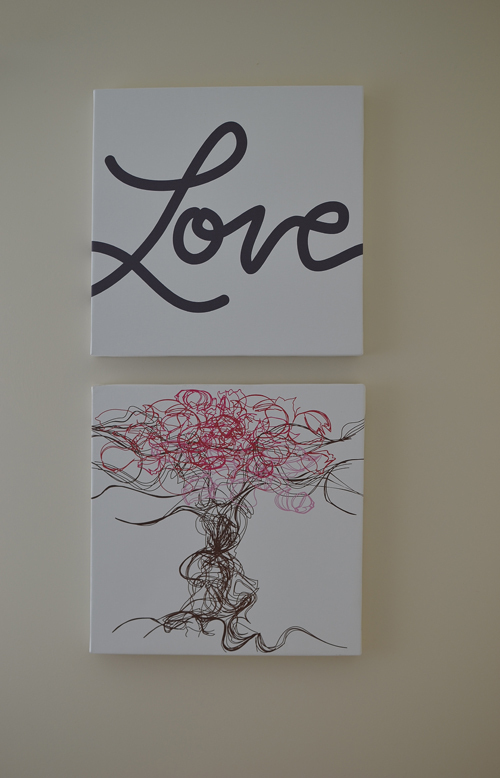 One lucky reader will win one 18" x 18" "LOVE" print (as pictured below) in any color of your choice. Leave me a comment and be sure to leave your email address! 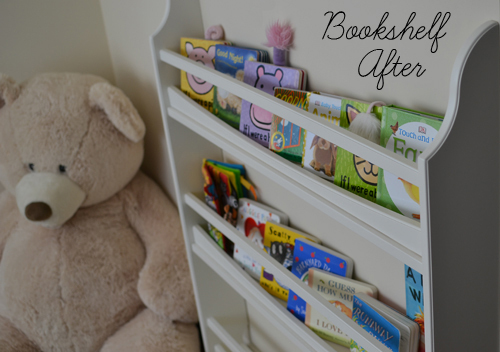 We installed a bookshelf for Eliana's growing book collection. 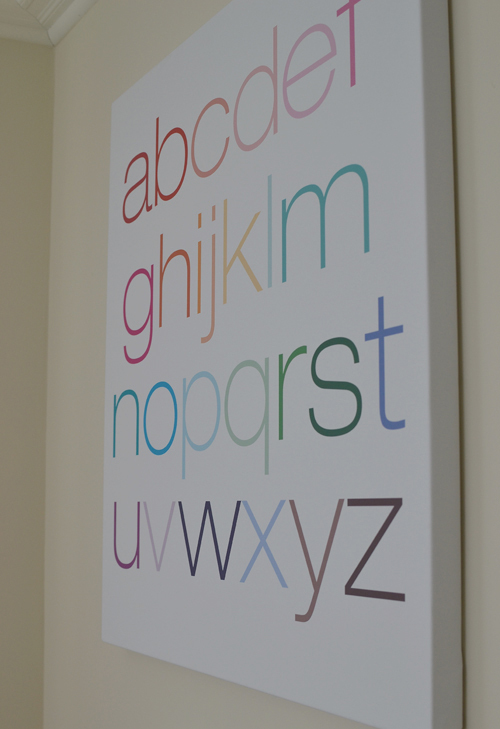 This modern alphabet print c/o Avalisa was THE perfect colorful addition to a boring, plain wall. I love the versatility of Avalisa prints. Their designs can be mixed and matched for an endless combination of chic wall designs that are perfect for any space in your home. 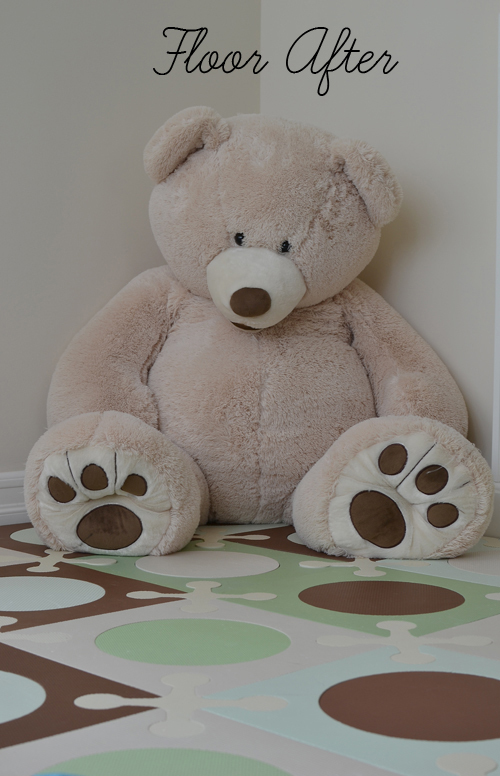 The addition of these foam floor tiles make for a fun, padded play area. Our giant teddy bear (from Costco) not only fills an empty corner, it also gives me something to rest my head on when playing on the floor with Eliana. Books are now neatly organized. 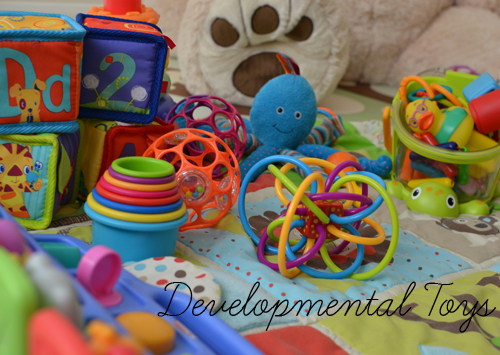 Lots of toys in primary colors and various shapes will keep your baby entertained. 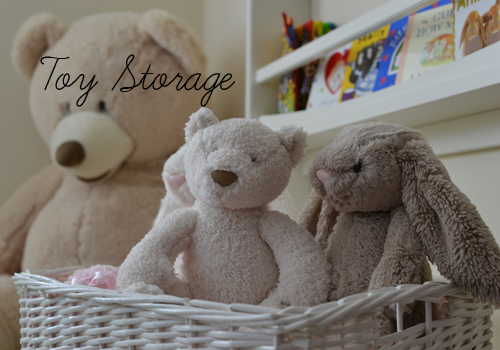 Use baskets for toy storage. 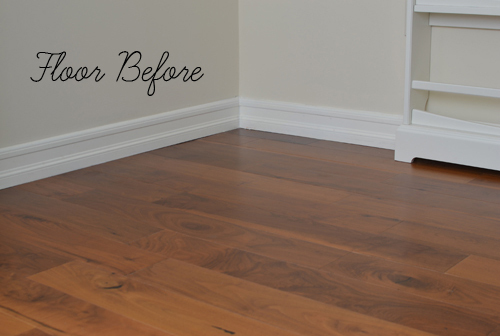 They're inexpensive and look great. That's such a lovely corner! And she is absolutely adorable! Eliana is so adorable like Mum.....& love the spaces you designed for her!!! Beautiful room for beautiful Eliana! And love the prints! SO cute!!! What a lucky little girl! aww, looks so cute and homey!! Great fashion and style ideas, thanks! Oh I just love those prints. I'm going to send you a message with my email address. Hope I win! Where did you get the bookshelf from?